LOS ANGELES, CA / ACCESSWIRE / March 12, 2017 / Foodservice industry kitchens are prone to disease and bacteria, fortunately for customer's sake, Health and Food inspectors monitor restaurants by strict health inspections. While many companies struggle to receive A-rating, there are others that wisely rely on deep cleaning companies assistance for a hygienic kitchen. The reasons behind deep cleaning a kitchen can be many, one main one would be the impression of a mucky kitchen restaurant visitors might receive. Even though after thorough cleaning a kitchen may appear tidy, it is the bacteria that is unnoticeable by bare eye that affects customers the most. Besides, ill-making diseases, a greasy kitchen also affects worker's health, safety and productivity. On average, restaurants maintain a hygienic appearance through mopping and wiping a kitchen, which unfortunately is not satisfactory in the longer perspective. As bacteria, disease, grease continue to collect, the kitchen becomes unhygienic, unless provided with an alternative. For example, deep steam cleaning, which is not only environmentally friendly, but able to remove bacteria, viruses, microorganisms and even surface mold - making it an optimal solution for a clean kitchen. One of such companies are Calamus Enterprises Kitchen cleaning service. Whom, recently expanded from its East Coast locations all the way to Southern California. The commercial kitchen cleaning is now serving Los Angeles, Orange County and San Diego area and are only one of the few businesses in the territory that provide commercial kitchen equipment steam cleaning and restaurant kitchen deep cleaning service for the foodservice industry. The specialized team is led by Mike Shuliak, a young energetic area manager, whom dedication to its clients have not gone unnoticed. "He is obsessed with top quality and premium service." - says the company CEO Mike Calamus. CE Kitchen Cleaning has been providing high quality deep steam cleaning service for restaurants and commercial kitchens for over 12 years and on average deep clean around 300 kitchens a year. Now, in Southern California, Shuliak offers deep steam cleaning for kitchens of any size, whether it being a food truck or a hospital kitchen. 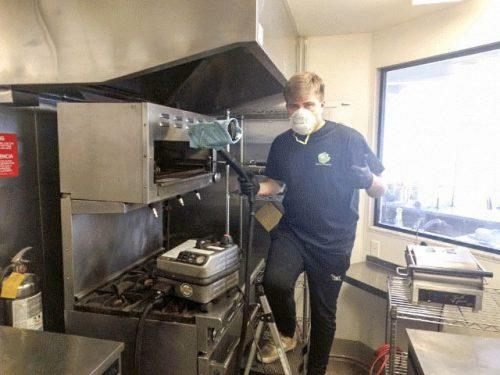 Throughout his career, Shuliak has noticed the growing demand for kitchen steam cleaning service as restaurant owners become more aware of the complications dirty kitchen can cause. CE Kitchen Cleaning Los Angeles & San Diego cleans various parts of the kitchen, which collect grease and dirt - the equipment, walls, floors, ceiling, ancillary items, ventilation canopies and filters, plus ventilation ductwork. They differentiate from their competitors by disassembling each and every part of equipment in the kitchen, even though a quite time-consuming work, they assure that it is worth the wait as the restaurant will have once again a hygienic kitchen. Shuliak advises that commercial kitchens need deep steam cleaning at least once to twice a year, to maintain the kitchen's equipment and cleanliness of the restaurant. As an independent business, Calamus Enterprises LLC sister company CE Kitchen Cleaning is able to a guarantee that their customer’s kitchens will pass Health and Food inspections after their cleaning service. The team is highly trained and provides detailed work to each and every client with even the dirtiest kitchen.